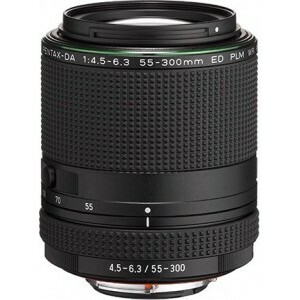 PENTAX 55-300mm F4.5-6.3 ED WR is an Auto Focus (AF) Telephoto Zoom lens with APS-C / DX max sensor coverage. When mounted on a APS-C / DX sensor camera, it will give you an FF equivalent focal range of 82.5 - 450mm. With the max apertures of only f4.5 at 55mm, and f6.3 at 300mm, the lens is quite slow at both ends. PENTAX 55-300mm F4.5-6.3 ED WR is weather sealed which makes it an ideal lens for outdoor use, especially when coupled with a weather sealed camera body. is the HD PENTAX-DA 55-300mm F4.5-6.3 ED PLM WR RE a Weather Sealed lens? is the HD PENTAX-DA 55-300mm F4.5-6.3 ED PLM WR RE an Autofocus (AF) lens?